After two years as runner-up we’re delighted to win the Nation’s Favourite Shooting Ground 2017 award as voted for by Clay Shooting Magazines readers. 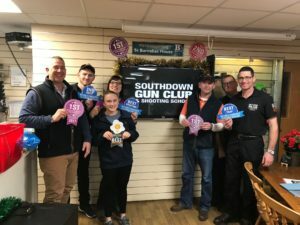 We retained the title of South East’s Favourite Shooting Ground for the third year running, putting us firmly on the Region’s map as the ground to shoot at. In addition, we won “Best Sporting Ground” which is a great accolade to our famous Sporting practice and competition targets. Not to be left out our brand new DTL layout won “Best Trap Ground” this really was an award that we did not expect to win. The Café also got in on the act with “Best Breakfast”!! So to say we are delighted with these results is an understatement, we are really pleased with the recognition of our commitment to the sport, which makes Southdown one of the best clay shooting facilities in the country. We’d like to extend a BIG thank you to everyone who voted for us in Clay Shooting Magazine’s Favourite Shooting Ground Competition.